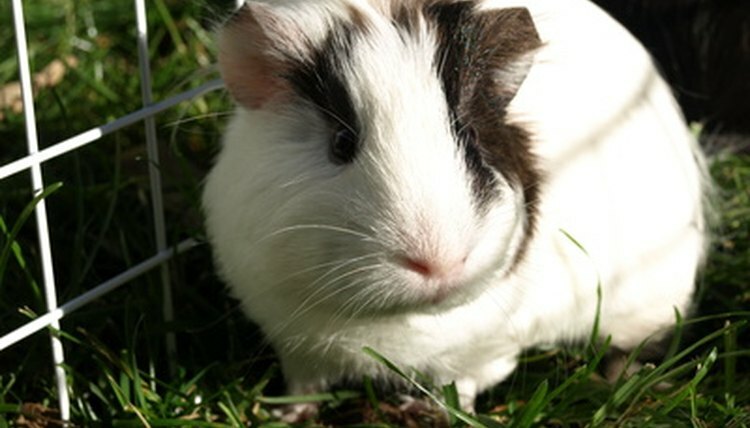 Guinea pigs are either smooth-coated with short hair, Abyssinian, with tufted hair, or Peruvian, with long hair. No matter which type you have, a dripping water bottle can cause a mess in their bedding and their fur. Although your piggy may enjoy an occasional bath, you don’t want to bathe him every day. Removing the faulty water bottle and observing it closely will show you where the leak is so you can fix it. Remove one side of the metal holding clip on the outside of the cage. Pull the water bottle straight out to remove it from the clip. Hold the water bottle with the metal drinking tube pointed upward. Turn the lid counterclockwise to unscrew it and lift it straight up and off the bottle. Stopper the kitchen sink and pour in a liberal amount of dish soap. Add hot water and swirl it with a spoon to make dish soap bubbles. Immerse the top and bottom of the water bottle in the sink to soak until the water is cool enough to place your hands in it. Clean the plastic water bottle interior with a bottle brush. Scrub up and down the entire surface. Push a pipe cleaner entirely through the metal drinking tube to clean it and the metal ball inside. Guinea pigs may spit food into the tube while drinking, displacing the ball and causing the bottle to leak. Fill the bottle with soapy water, screw the lid on and shake the bottle vigorously for a minute or so. Hold the bottle with the spout pointing down and look for tiny bubbles on the outside of the water reservoir. This indicates that small pinholes in the plastic area are causing the bottle to leak. Wipe the exterior of the bottle off and mark each hole with a marker. Rinse the inside of the bottle with hot water. Dry the bottle’s inside with a towel and apply an all-purpose quick-setting glue to seal the holes. Remove the rubber washer inside the lid. Observe the washer for cracks. Bend the washer to test its elasticity. Replace the washer with a new one if it has cracks, if it breaks or if it is dry and brittle. When the washer needs replacing, it will not form an airtight seal between the water reservoir and the lid, causing leaks in this area. Fill your guinea pig’s water bottle with fresh water, screw the lid on tight and tap the ball in the spout a few times to seal it. Reinstall it on the cage.  Water bottle lids that are not screwed on tightly or that are cross-threaded when screwed on tend to leak around the lid.  The metal ball in a pet water bottle spout equalizes pressure inside and outside the bottle to seal the drinking spout when not in use. ⚠ Clean your piggy’s water bottle daily when you give her fresh water. Daily cleaning keeps the water from becoming stagnant and harboring bacteria.